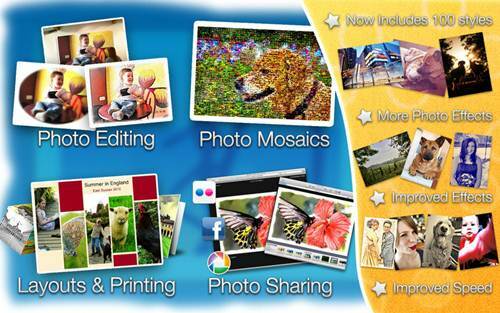 Funtastic Photos is a "non-permanent and easily reversible" photo editor. Funtastic Photos has over 60 easy to use 1-Click Styles, an Advanced Effects engine, direct sharing via Fun Cards, mobile (inc. iPhone) and popular photo sharing sites (flickr, Facebook, Picasa & MobileMe). Funtastic Photos features a creative print layouts system, with awe-inspring projects, including photo mosaics, greeting cards, photo cubes, mini photo books and more! Check out our YouTube videos and see how easy it is to use Funtastic Photos! ?Really easy to use: When we say "Easy to use" we mean "Really easy to use!". The media and our customers have literally described Funtastic Photos as the Mac photo software without a learning curve, a solution that everyone can use. ?Photo Editing: Over 60 1-Click Styles await, making it a cinch to frame a picture, fix a not so stellar image, intensify a great photo, confess your love (romantic effects), travel back in time (vintage photography), fake the HDR look or turn a photo into a pencil illustration or painting. Underneath the 1-Click Styles, we have a powerful and flexible effects engine. There's more than 40 effects, which can be manually adjusted. They're all grouped in one location and can be changed on the fly. You can even use the effects to build your own custom 1-Click Styles or modify existing styles. ?Live Photo Editing: Also known as Reversible editing or non-destructive editing is the unsung hero of Funtastic Photos and it's embedded right in the core. With Live Photo Editing we never alter or harm your original photo, instead effects are applied on top the photo. Any edit to your photo can be changed or removed at any time, minutes, days or years later. Using this system we can easily Revert your edited photo back to it's original state, whenever you may want it, or you can simply dial down an effect, or enhance a specific area. Funtastic Photos own file format has been custom engineered to complement Live Photo Editing, with the added benefit that you can recover your original image even on a computer that doesn't have Funtastic Photos installed! ?Photo Printing: A major feature of Funtastic Photos is the smart WYSIWYG printing system. Included is a bunch of creative layouts, for arranging your photos. Ranging from 1,2,4,7 layouts, photo walls, mini Fun Books & Yearly posters. Making unique and special Greetings Cards is easy with our photo editor, use your own pictures (and some captions) to create beautiful Birthday cards, Christmas cards, Thank you cards and Congratulations cards. If you're into scrapbooks or scrapbooking, join others who use Funtastic Photos for enhancing and labeling their pictures, before arranging their photos in our fantastic layouts. Photo Cubes are a superb way of showing off your pictures, throw 6 images into our Photo Cube template and print. The Cube even includes assembly directions, however, one is never enough. ?Photo Mosaics: Photo Mosaics or Picture Collages are those amazing posters which are built up of individual photos. These wondrous pictures are found all over the world, and are truly amazing to look at. At Ohanaware, we absolutely love these posters and we wanted an easy way to make our own Photo Mosaics. So we built a straightforward mosaic generation tool directly into Funtastic Photos. It's a great feature to have at no extra cost, a separate program for building photo mosaics can easily cost $50! ?Photo Sharing: Sharing photos online is a great way to show everyone (inc. Parents & Grandparents) your amazing pictures. Funtastic Photos makes sharing photos online, second nature. An easy to access "Share" button enables a single photo to be uploaded to the photo sharing sites that you use. Built-in support for sharing to online services such as Flickr, Facebook, MobileMe & Picasa. No other software required. Do you miss the Apple iCard's feature from the old iTools? We did, so we built it into Funtastic Photos. Send brilliant and unique Fun Cards, using your own photos. A bunch of customization features help to create really cool fun cards. Other sharing options, include iPhoto (which also syncs with iPhone/iPod), bluetooth, iChat (message appears in the current conversation) & even the ability to quickly set your picture as the desktop picture. ?Now includes 100 1-Click Styles. ?FIXED a handful of bugs including the meta data issue. ?Fixed a bunch of issues. Intel, Mac OS X 10.5 or later. Funtastic Photos 1.0.8 Mac Os X Download via Hotfile Rapidshare Fileserve Megaupload & FileSonic, Funtastic Photos 1.0.8 Mac Os X free torrent downloads included crack, serial, keygen.